The accolade “Switzerland’s Best Winter Hotel 2018/19”, courtesy of Karl Wild’s hospitality ranking in the Sonntagszeitung newspaper, is both an honour and a pleasure for The Chedi Andermatt. It confirms that the multi-award-winning 5-star deluxe hotel has successfully – and entirely justifiably – positioned itself at the top of the Swiss luxury hospitality segment. “Our success lies in the ‘Chedi’ spirit and is based on emotions for all the senses, created for our guests on a daily basis,” says General Manager Jean-Yves Blatt. With its 123 elegant rooms and suites, The Chedi Andermatt offers holiday experiences that could not be more luxurious, delighting guests from home and abroad with its unaccustomed yet perfect combination of Alpine chic and Asian expression. Located in the heart of the Swiss Alps at an altitude of 1,447 metres, the 5-star deluxe hotel is imbued with the power and tranquillity of the surrounding mountains, distinguishing itself as a destination for active pleasure-seekers in winter – the SkiArena Andermatt-Sedrun boasts 120 kilometres of groomed first-class slopes and a new skiable link between the Andermatt and Sedrun resorts – as well as those in search of a more relaxing experience. The Chedi Andermatt combines a unique service culture featuring attention to detail and fine dining with feel-good wellness moments in the 2,400 square metre The Spa and Health Club. It is the perfect mixture of exceptional experiences, pleasurable seduction, architectural expression, flawless harmony and discreet luxury that prompted Karl Wild to arrive at his choice. “There are hotels that take the guest’s breath away when they come through the doors. Hotels where the guest feels not ‘at home’, but in a different, more beautiful, more fascinating world. The Chedi is one such ‘dream home’ – a rarity throughout the world. The centrepiece of Samih Sawiris’ billion-franc tourism project in the Ursern Valley is the most spectacular hideaway ever, a blessing for the entire region,” declares the renowned author and journalist Karl Wild, explaining his choice. The award of “Switzerland’s Best Winter Hotel 2018/19” is one of the finest gifts The Chedi Andermatt could receive for its fifth anniversary, which it celebrates on 6 December 2018. Since its opening in 2013, the 5-star deluxe hotel has put the needs of its guests first: guests who want nothing more than to put everyday life to one side during their holidays and travel home with a backpack full of exceptional memories. “We create moments for all the senses, day in, day out – be it through the location, the design and architecture, the facilities, the entertainment in and around the establishment, our gastronomic statements or our dynamic, first-class service. The entire The Chedi Andermatt team is responsible for our continuing success, which is why this award belongs to everyone who works here. They make the hotel what it is today. I am particularly grateful to proprietor and investor Samih Sawiris, who has made the impossible possible with his vision, his passion and his commitment. 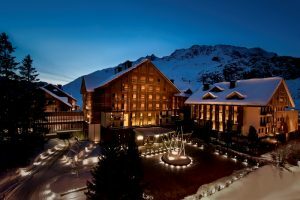 All this has helped Andermatt develop into an internationally renowned destination and The Chedi Andermatt into one of the best hotels,” says a delighted Jean-Yves Blatt.